TFG Asset Management has spearheaded a high-level hotel industry debate on effective green practices, raising the company’s profile as an authority on major issues facing the sector. The TFG Asset Management team partnered with the Middle East’s leading hotel school, Emirates Academy of Hospitality Management, to stage the ‘Go Green’ breakfast event on 21st March, 2016. More than 60 industry professionals attended the exclusive, invitation-only forum, which saw tourism, hospitality and sustainable practices experts discuss current and future green initiatives for the hotel industry. It followed the recent launch of TFG Asset Management’s research paper, ‘The Hoteliers’ Guide to GOING GREEN in the UAE’; the findings of which were also presented and debated. “This very well-attended, high-level breakfast discussion, provided a platform for lively debate and ideas exchange,” said Head of TFG Asset Management, Mariano Faz. The event opened with welcome remarks from Dr Michael Newnham, Assistant Dean at Emirates Academy of Hospitality Management, followed by a presentation on the Dubai Government’s new green initiatives by Solaiman Al Rifai, Senior Manager of Tourism Development & Investments at Dubai Tourism. The key findings of the research paper were then outlined and discussed by Mariano Faz before Jesus Gutierrez, Co-Managing Director of Smart4Power, a strategic partner of TFG Asset Management, provided an overview of cost-effective green practices hotels should consider. In order to give the audience insight into real-life scenarios, Iftikhar Hamdani, General Manager of Ramada Hotel & Suites and Ramada Beach Hotel Ajman, outlined a case study on effective sustainability measures adopted by his properties. The breakfast session concluded with Amelie Zegmout, Board Member of Emirates GBC, emphasising the importance of implementing an accreditation scheme for green initiatives in the hotel sector. “Today, incorporating green practices is not an option, but should be a must for all hotels,” said Faz. 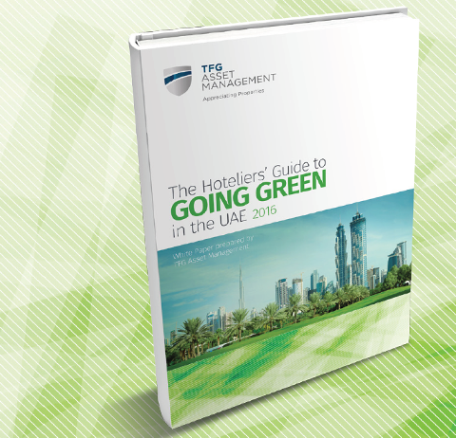 ‘The Hoteliers’ Guide to GOING GREEN in the UAE’ white paper was distributed with the March edition of Hotelier Middle East, but can also be found in the TFG Asset Management Library section (tfgassetmanagement.com), or on Hospitalitynet.org (hospitalitynet.org). It is the second of TFG Asset Management’s research papers to be published in the last 12 months, with more planned this year. All future papers will be produced in collaboration with the Emirates Academy of Hospitality Management, under a new initiative launched by the two entities called the Research Hub. “Our vision for the Research Hub is to create detailed, top-quality research papers that provide valuable content to hoteliers on topical industry issues,” explained Faz. TFG Asset Management specialises in hotel asset management and its primary objective is to maximise the hotel owner’s return on investment. The company assists with managing every aspect of a completed hotel development and acts as an intermediary between owner and operator, with a view to aligning the interests and profitability of both parties. TFG Asset Management currently manages three hotel apartment projects offering a total of 3,000 keys and will add four new hotels to its hospitality portfolio by the end of 2018. The company employs an experienced Asset Management team and partners with some of the world’s leading hospitality brand operators in order to position and manage its hospitality projects with future growth in mind. TFG Asset Management’s main roles include the daily control of hotel operations and the provision of strategic solutions to enhance revenue generation and property values, ensuring they exceed owner expectations. For more information, visit: www.tfgassetmanagement.com. The First Group is an award-winning British-owned international hotel & property development company, whose principals have built up their expertise and success in the global market over the last 30 years. The First Group management team draws from strong and diverse backgrounds in the fields of global property, finance, acquisition, marketing and product development. Its expert eye for emerging property market potential and prestigious partnerships with industry leaders means that their clients can enjoy secure and attractive returns from one of the world’s most vibrant hotel markets. With its global headquarters in Dubai and offices spanning Moscow, Almaty, Kazan, Astana, Baku, Abuja, Lagos, Jeddah, Riyadh, Khobar, and most recently Accra , The First Group’s client base is expanding rapidly. The Emirates Academy of Hospitality Management (EAHM) in Dubai is one of the world’s leading hospitality business management schools and an integral part of the global luxury hotel company, Jumeirah Group. It is a leading provider of University-level hospitality business education and offers both undergraduate and postgraduate degrees designed to develop the hospitality leaders of the future. EAHM works in academic association with Ecole hôtelière de Lausanne and all programmes of study are fully accredited by the Ministry of Higher Education and Scientific Research in the United Arab Emirates, the Institute of Hospitality in the United Kingdom and THE-ICE (International Centre of Excellence in Tourism and Hospitality Education) in Australia. It is also a higher education member of the Council of International Schools (CIS). For further information and enrolment requirements, please visit The Emirates Academy of Hospitality Management online: www.emiratesacademy.edu.